Walker’s hopes for remaining on the national stage are riding on a lead in the polls so narrow that it’s within the statistical margin of error, and the race is rated as a toss-up. In September we found that both sides were playing “spin the voter” over Walker’s record on job creation, and that hasn’t changed in the final flurry of ads before Election Day. The fact is that over Walker’s full term in office, which began Jan. 3, 2011, the state’s job gains have been well below the national average, and rank (in percentage terms) only ninth among all 12 Midwestern states. And what those figures show is that as of September, the most recent figures available and the last that will be released before Election Day, the state has gained 4.3 percent in total employment since Walker took office. Meanwhile, the United States as a whole has gained 6.6 percent during the same period. We’ll note once again that elected officials have only limited influence over the broad economic forces that drive the economy, and frequently claim more credit or receive more blame than they really deserve. But Walker made a campaign promise in 2010 that if elected he would create 250,000 jobs during his four-year term, and he repeated that pledge when he was inaugurated. So far the state has added less than half that many — 118,700. To be sure, the state’s economy has picked up steam in the most recent 12 months, as has the national economy as a whole. But even during this period, Wisconsin is still below the national average, and ranks fifth among all 12 Midwestern states. Our calculations put the state’s gain in total employment at 1.5 percent since September of last year. During the same period, the U.S. as a whole gained 1.9 percent. 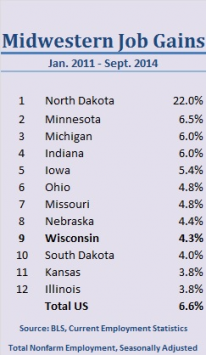 So Walker is correct when he says in his ad that the state is “not last” — but it’s only in the “top four” among the 10 states Walker uses for his comparison. In Walker’s defense, the state’s unemployment rate improved in September to 5.5 percent, which is slightly better than the national average of 5.9 percent. 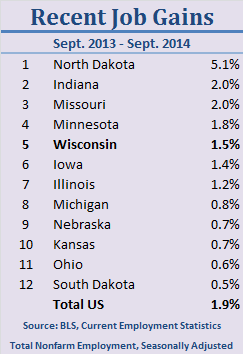 Wisconsin is currently tied with Virginia for the 17th lowest jobless rate among all 50 states. But it’s also true that despite the gains under Walker, nearly 23,000 fewer people were employed in September than at Wisconsin’s high point, which was June 2007. Unlike the country as a whole, the state has yet to regain all the jobs lost during and after the Great Recession of 2007-2009. So the state’s economic performance under Walker is neither as good as he would have voters believe, or as bad as his Democratic critics were still claiming as recently as Oct. 13 in an ad saying Wisconsin job growth under Walker is “dead last in the Midwest.” As we’ve seen, it’s not. In 2013, Walker signed “Act 20” (the massive state budget bill), which contained section 1304g, providing a deduction from state income taxes for private school tuition. Actually, the deduction is up to $4,000 (per pupil, per year) for elementary school tuition and $10,000 (per pupil, per year) only for secondary school tuition. But, you don’t have to be a “millionaire” to claim the deduction. Wisconsin’s state income tax starts at 4 percent of taxable income up to $14,540 for married couples, and goes up in steps to a maximum of 7.65 percent on income over $320,250. So plenty of middle-income parents can take advantage. The benefit also can be claimed for “religious-based” education, so thousands of parochial school parents will benefit. In the Diocese of Madison, which covers 11 of the state’s 72 counties, for example, there were 7,437 students enrolled in 44 Catholic schools during the 2012-2013 school year, and the average tuition for elementary school was $2,170 for the first student. The tax break took effect for tuition paid in 2014. Walker’s Democratic opponent, Mary Burke, has said she would eliminate it. The same attack ad makes the claim that Walker’s friends got “a massive strip mine after they made secret donations to help him” totaling $700,000. “We could get arsenic in our drinking water,” the narrator says. It remains to be seen how great a risk the mining project might present. And Walker states that he wasn’t aware of the $700,000 donation until it came to light in August of this year. There’s no question that Walker benefited from the gift to the Wisconsin Club for Growth, whether he knew the source or not. The Club for Growth spent $9.1 million supporting Walker during recall elections in 2011 and 2012 that drew national attention. It’s also no secret that in 2013 Walker supported and signed a bill sought by the mining company, Gogebic Taconite, that was the source of the recently disclosed gift. Gogebic Taconite wanted changes to state mining law to clear the way for a $1.5 billion open-pit iron mine, which Walker says he backed because of the jobs and economic benefits it would bring. It’s also true that arsenic and lead are among the many “trace elements” that can be found in waste water from metal mining, according to the Montana-based Center for Science in Public Participation. However, at the moment the iron mine project is in the very early stages of permitting. According to the Wisconsin Department of Natural Resources, granting a permit “can take several years” and would require an environmental impact statement. The project would be subject to both state and federal regulation, the latter under the federal Clean Water Act. So we judge it to be premature to be accusing Walker of slipping arsenic into the state’s drinking water. A last-minute ad from a state business group attacks Burke, the Democratic candidate, for her record as head of the state’s Department of Commerce under Walker’s predecessor. “She admitted her agency sat on the sidelines and failed to attract new businesses,” the ad says. It also quotes an email from Burke’s predecessor at the department as saying, “She’s a disaster.” And it goes on to say, “Maybe that’s why Wisconsin lost 130,000 jobs when [James] Doyle was governor.” It is sponsored by the Wisconsin Manufacturers & Commerce Issues Mobilization Council. We find this ad to be misleading. Wisconsin actually gained jobs during Burke’s tenure as commerce secretary, which started Feb. 7, 2005, and ended in November 2007. The state gained 49,500 jobs during that time. The big job losses came only later. The month after Burke left the Doyle administration marked the official start of the worst U.S. recession since the Great Depression. It lasted from December 2007 until June 2009. The collapse of the housing bubble and the subsequent financial crisis wreaked havoc nationwide, not just in Wisconsin. It’s true that Burke criticized her own agency for sitting on the sidelines and failing to attract more businesses to the state — as she was leaving government, and after she had reorganized the agency. It’s also true that Burke’s predecessor as commerce secretary told an aide to the governor that Burke was “a disaster.” The remark was in an email dated Sept. 3, 2006, and it only surfaced on Oct. 16. What the ad fails to mention is that the author, Cory Nettles, states that he has no memory of writing the email, and that the remark does not reflect his current view of her tenure as commerce secretary. “Let me be clear, I have a lot of respect for Mary Burke,” Nettles told a columnist for the Milwaukee Journal Sentinel.